Photo of algae bloom courtesy of NOAA. When it was discovered that nitrogen was the most important ingredient for both explosives and fertilizer, our military industrial complex and food production became dependent on vast stockpiles of synthetic chemicals. Many of the original chemical pioneers who built weapons factories found an easy shift from making bombs to making agricultural products and also pharmaceuticals. Examine the histories of Pfizer, Monsanto, Dow Chemical and DuPont and they follow a similar tract: explosives to agricultural. DuPont, Pfizer, and Monsanto all shifted into pharmaceuticals and biotech. Chemical manufacturing began just prior to WWI, but as scientists and engineers were developing complex methods to synthesize nitrate, an old tradition was becoming far more precise: composting. Maintaining proper proportions of nitrogen and carbon would create ideal conditions for anaerobic decomposition. This process could quickly convert plant and animal waste into a growing medium that was a biological nutrient-producing powerhouse. By tapping into the power of microbiology and precisely feeding microorganisms, small farmers could increase soil fertility. Of course, composting had been around since the dawn of time. But as it became known what conditions produced and aided in the destruction of pathogens and weed seeds, and what conditions aided beneficial mycelium and micro-flora, farmers could vastly increase yields in small plots. Farmers (especially in Europe and Japan) were finding innovative natural solutions which included Rudolf Steiner´s biodynamic methods to feed greater populations on less land. But the war efforts to build nitrate factories for bombs offered the promise of a less labor-intensive approach to farming. Composting required stirring and monitoring compost pile temperatures; fertilizer usage only required using a tractor with an implement to spread granular NPK. By the end of World War II, according to MOTHER JONES magazine, the United States had built 10 large-scale nitrate factories to make bombs. With Europe’s and Japan’s production facilities in ruins, the US entered the postwar period as the undisputed global champion of nitrogen production. The industry quickly shifted from munitions to fertilizer and domestic consumption began to skyrocket. However, nitrate usage depleted rather than aided soil microbiology. But as often is the case with supply-side economics, fertilizers were so readily and widely available that the practice was adopted across the U.S. The immediate result allowed the United States to produce amazing crop yields. Farmers fed the baby boomers and also exported corn, soy, and wheat to the countries destroyed by WWII. Bombs leveled them and the same nitrate fed them. This is why synthetic fertilizer will go down as one of mankind’s greatest inventions. Small farms could now consolidate into mega-farms and the surplus labor force could be harnessed in factories to build machines to and maintain the United States global economic superiority. The advent of chemical fertilizer was, of course, a boon for chemical companies. The new era of industrial agriculture, compared to the biological solid building methods of using compost and manure was a no-brainer: why attempt to teach farmers to produce tons of compost when bags of granular fertilizer could be mass-produced and sold instead? Not that this question was ever asked, it was simply a time when Americans believed big industry was the key to solving the world’s problems. Indeed the world had some big problems: starvation, sanitation, war. America provided the solutions. The side effects of our chemical-laden society were either dismissed or ignored. 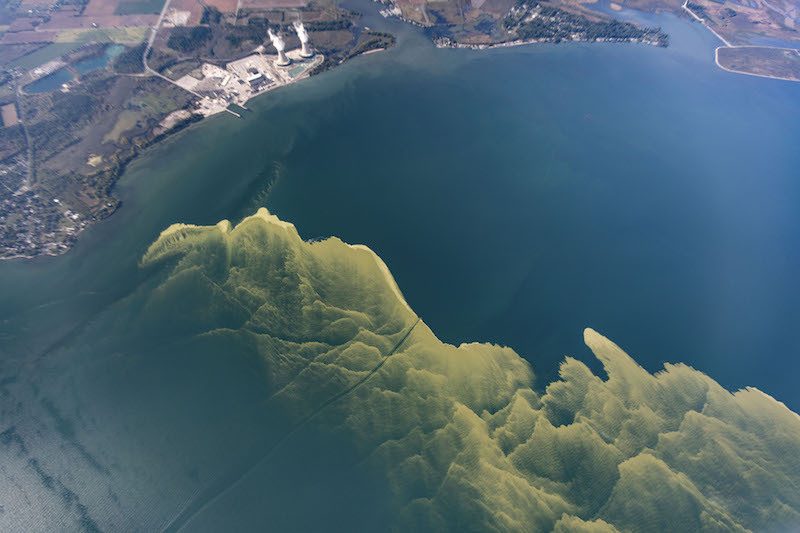 Unused nitrate in the soil contaminated groundwater causing algae blooms (which feed on nitrogen) thus created dead zones in oceans and lakes. Fish would become unable to feed on surface insects due to the cover of blooming algae. Excess nitrates are now recognized as one of the most harmful environmental problems facing the United States. A U. of Northern Illinois study found “Groundwater contamination in the Central Valley of California is widespread because of excess nitrogen fertilizer leaching down into the aquifer.” To mitigate the impact, The Federal government is now subsidizing farmers with over $20 billion in incentives for them to plant cover crops to capture excess nitrogen. Still, the algae blooms in the Gulf of Mexico and the Gulf of California are increasing. These blooms are worsening due to the increases in water temperatures in these areas. While the government subsidizes the status-quo of heavy nitrate usage and then attempts cleanup efforts, there could be a better alternative: to ween our farms away from NPK and back to compost. Instead, they provide no aid to farmers who have shifted their farms away from chemicals to compost and soil building. If the federal Food and Drug Administration, U.S. Department of Agriculture, the Center for Disease Control, and Environmental Protection Agencies all began subsidizing soil-building methods that promote biology rather than maintaining the status quo of chemical-rich agricultural production, America’s environment and overall health would be far better off. Why should we essentially subsidize low-cost carbs when we know that heart disease and diabetes are caused by diets too heavy in carbs? But currently, billions are made by dozens of massive multinational corporations due to the chemical paradigm production model. Lobbying efforts by Dow, DuPont (which have recently merged), Monsanto (now owned by Bayer), ConAgra, Pfizer etc. will prevent our agricultural paradigm from shifting. Only consumer awareness will cause significant short-term change. The non-GMO movement and the fact that 68% of consumers reject the wide-spread use of GMO (RoundUp ready) corn, soybeans, and wheat, is a sign that consumers are waking up. The next step would be for a massive petition targeting the FDA and their continued support of heavy glyphosate, nitrate, and GMO farming methods. It’s clear to the public that these methods are inferior to organic, natural and biological methods. The question boils down to: Why is a government agency (the FDA) that is designed to protect America’s health instead of protecting the shareholders of major chemical companies? We know the answer, it’s about time they provide an answer to those who provide their tax dollars.